An electronic billboard is circulating in the Socastee area congratulating the Clemson stand-out on his second national title after Clemson defeated the reigning Alabama Crimson Tide 44-16. Friday, Renfrow was awarded the 2018 Bobby Bowden Award, given annually to the Division I player who epitomizes dedication to faith, family, friends and football. 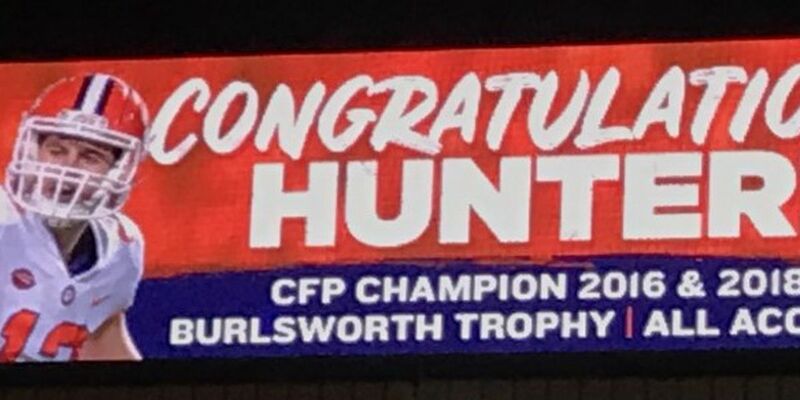 The billboard lists Renfrow’s resume in the orange and purple, honoring two CFB titles, All-ACC placement, and 2018 Burlsworth Trophy (most outstanding player) recipient. Renfrow racked up 186 receptions for 2133 yards and 15 touchdowns in four years at Clemson. Renfrow will play in the upcoming Senior Bowl in Mobile, Alabama.